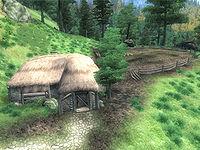 Odiil Farm is a farmhouse southeast of Chorrol (quest-related). It is owned by Valus Odiil, and his two sons, Rallus and Antus, live there. The farm has recently been attacked by goblins. There is a sample of Nirnroot and three bottles of Cyrodilic Brandy in the farmhouse. Esta página foi modificada pela última vez à(s) 08h32min de 4 de setembro de 2015.